It's that time again, when the American Library Association and other national organizaitons focus on books that have been banned or challenged in the US. The challenges may occur at a store, a library or a school. Sometimes a book will be 'allowed' but only hidden behind a counter. Now, books can be revolutionary, it's true. Reading does broaden the mind and offer new perspectives. Books can teach you, inspire dreams, and give hope. But to hide them? To deny other people the chance to read it simply because you don't like it or you disagree with it? Why? Why should your tastes determine what I read, what I learn? Why should your beliefs take precedence over mine? Don't like it? Don't read it. Don't want your child to read it? Why? Have YOU taken the time to read it? Why not read it with your child? Be there to discuss the book and offer your thoughts on it. Maybe there's a book on a similar theme that you prefer; offer that to your child in conjunction with the other book. Censorship is slippery. There are books that I passionately disagree with and would rather not see for sale or available to read but where do we draw the line? Whose taste and judgement take precedence? Think for yourself, make an informed judgement, and let others do the same. 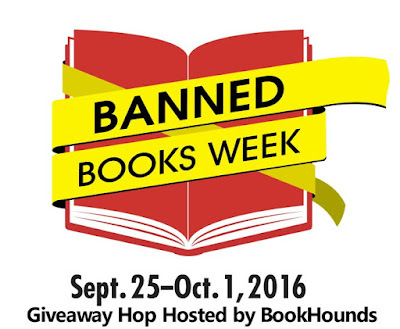 For more information about banned books and banned books week, check out this site and this site. To see lists of books that have been challenged or banned, go here. I'm giving away a $10 Amazon gift card so you can purchase your own challenged or banned book. Open to anyone who can receive and use an Amazon gift card. No purchase necessary. VOID where prohibited. Giveaway ends October 1st, 2016 and is open to all who can legally enter. It's frightening how many children's books are challenged or banned. I'm not sure yet, there's some upcoming releases that look really interesting too, but definitely some YA title. Not, sure but I know it would be a cozy mystery of some sort. I'm not quite sure what book I'll like to read. Harry Potter for my nephew. Not sure but a mystery book. I would buy Two Boys Kissing, by David Levithan! I would buy a mystery or harry Potter. I would buy my grandsons the book Where the Wild Things Are . Honestly no idea what I would get, there's so many! I don't get censorship, it's like the easiest way to admit that you're not right about something. If you had confidence that your view was correct, then wouldn't you have confidence that it would win out on its own, without other ideas being hidden? I do, however, understand restricting books based on appropriateness for age at schools. That's it though. Now see, I have trouble with restricting books due to age appropriateness. No two children mature at the same rate or have the same life experiences. What's tame for one 8 ear old might give another nightmares. So, instead of preventing children from reading them, instead why not be aware of what they are reading, be available, and discuss it with them? I agree with you that children are individuals, and can handle books at different levels. But you wouldn't advocate for putting, say, Fifty Shades of Grey in an elementary school library, or on the shelves at your preschool, would you? I think that while there's certainly plenty of individual variation in what kids are ready for at various ages, there are a few broad generalizations one can make when it comes to young children and decidedly adult content. But those are the easy decisions. It gets trickier when you're talking about YA books in a middle-school library. And it's far more difficult to make those determinations for a high school library, because at that point, the individual variation in maturity/readiness can encompass anything from MG books to very adult themes. Therefore, I can see making "age-appropriateness" a consideration for elementary-school libraries and to a lesser extent middle-school libraries, but probably not for high-school libraries. Of course, the issues of shelf space and of matching books to the reading level and interests of the majority of your patrons also tend to limit the selection in a school library at whatever level. And that cuts both directions. You're not going to find many picture books in most college libraries, for instance, unless they maintain a collection of them for a specific reason. All that said, in general I oppose the banning of books, and certainly at the high school level and above. I would buy Two Boys Kissing. I think I would put it toward Saga, the graphic novel series, which made the ALA's Top Ten Banned/Challenged Books list for 2014. I've heard amazing things about that series. Oh, I haven't heard of that one. I'll have to look it up. I would buy Come Away With Me by Karma Brown. I might get RAINBOW BOYS. I don't know which to chose there are so many to pick from. I hope everyone fixes their settings so they can get to the Bookhounds site to join. Thank you, participating book bloggers for setting this up. I need to have Crooked Kingdom! C.L. Stone's Black and Green is coming out soon. And I'm sure it would be a contender for the banned book list. I would get something in the PNR genre or UF. I've got a long list of books that I would like to own. 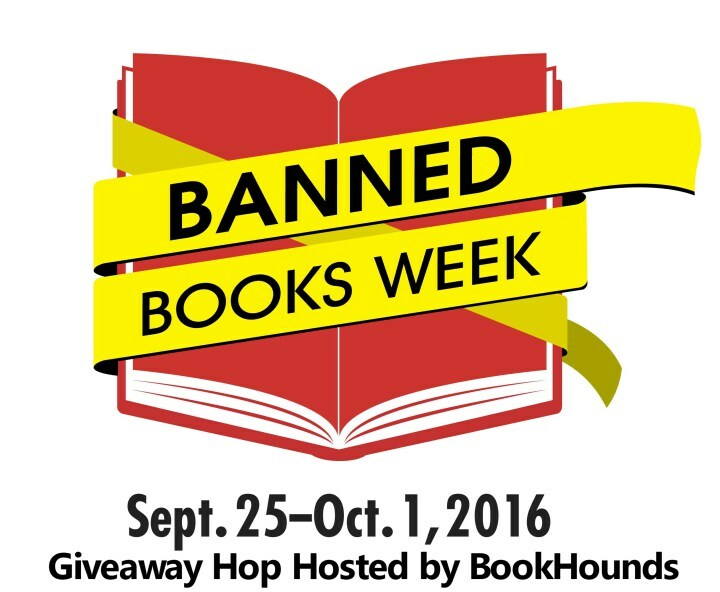 Thank you for sharing Banned Books Week and the giveaway! I would get the rest of Kallystens books. I love her genre. - Green, John: "Paper Towns"
- Kleinbaum, N.H.: "Dead Poet’s Society"
I would buy books. Not sure which ones yet, but I'd definitely shop! I really think I want to get A Hero Ain't Nothing but a Sandwich for my daughter. I despise censorship of books. Ignorance is a huge issue - just as you mentioned, if people would take the time to educate themselves about the issues, the fear would lessen. Many books would never be an issue in the first place. People should always think for themselves; remember children think too. Share thoughts together. Read together. Respect opinions. If children can't go to their parents for open discussion and honest answers, they'll look elsewhere. I would buy one of the newer books. Like maybe Holding Up the Universe! I'm not sure yet but I am behind on some of my favorite series so I am sure it would be one of those. I have been reading the Harry Potter books on Kindle Unlimited but I would like to purchase them for keeps. I might get The Absolute True Story of a Part Time Indian. Thanks for the chance! Actually I wouldn't buy a book. I'm saving up all my Amazon bucks to buy a new tablet to replace my old and very slow one. I'm saving for a top end Kindle Fire tablet. Fire HD 10 Tablet, 10.1" HD Display, Wi-Fi, 64 GB, Silver Aluminum. Without the "special offers" it's a bit over $300.00. I would love to have my own copy of To Kill A Mockingbird. Thank you! The Completely True Story of a Part-Time Indian sounds really interesting. I would purchase a new Lee Child's book, I have read the first 4 and I am missing several! recently i bought a lot of books.so i guess i would buy something else this time. I would like to put it in on a cookbook. I love cookbooks of all kinds. I'd buy a fantasy book! I might get The Absolutely True Diary of a Part-Time Indian. Thanks for the chance to win!! I a looking forward to reading March Book #3 by Sen. John Lewis. I'd buy a devotional book. I'd get a new cozy mystery. I read Black Boy in high school and liked it. I'd love to have a copy of it. oh gosh i have no idea! it would be a hard decision! I am not sure what I would get. I would buy my grandson a new book by Mo Willems. I would love to buy one of the new Rose Harbor books by Debbie Macomber. I would probably buy The Raven King! If I won the giveaway, I would buy a new board game! I'd buy Magic Binds by Ilona Andrews. I would buy Amy Schumer's The Girl With the Lower Back Tattoo. I just know it's going to be hilarious. I always have a large list of things that I want to read but among them is Kaffir Boy. I would buy a historical book for my son, they are his favorite. I'd get The Kite Runner. I would either buy a book for my daughter or The Lady and the Lionheart. Oh, a book of some sort, I'm sure! hah I have so many on my wish list it's hard to say. I'm not sure what I would get yet. I need to go through my books to make sure I don't buy a double. I love books! I would probably buy Fifty Shades of Grey, because i'm probably one of the few that haven't either read the book or seen the movie. I somehow accidentally made my comment a "contact us" email. Oops. Anyway. I would use the gift card on probably not a banned book. I do have a lot of vegan and gluten free cookbooks on my Amazon wishlist and I would probably buy one of those to help with my lifestyle. I certainly can't imagine having books banned from me. It has to be terrible. I'm not sure which one at this time but more than likely I'd get a book by Lisa Renee Jones. I would love to get the captain underpants book for my son. He loves the series. I'd love to get either a stephen king or neil gaiman book that I haven't read yet. The Perks of Being A Wall Flower. I might read The Bluest Eye by Toni Morrison. I would have to go through the whole list of the banned/challenged books to see what everything is about. I don't know yet. I can always find a book that I want.